Zach Eflin fell victim to the long ball on Sunday afternoon, surrendering four, including a pair of two-run blasts to Adam Duvall, as the Reds trumped the Phillies 8-4 in the series finale at Citizens Bank Park. Immediately following the performance, the Phillies optioned the 23-year-old right-hander to Lehigh Valley. "It just won't do," manager Pete Mackanin said. "His first two or three starts were really good. He was keeping the ball down, but his last three - including today - everything is elevated, including his sinker and when that's elevated it doesn't have the impact you want it to have. "He needs to work on a few things, work on keeping the ball down and his secondary stuff. We've all seen him really good and we need him back there." To say Eflin has pitched pitched poorly as of late would be an understatement. Over his last three starts he's tossed just 15 innings, surrendering 22 earned runs. Compounding matters, seven of the last 30 hits he's given up have left the ballpark. 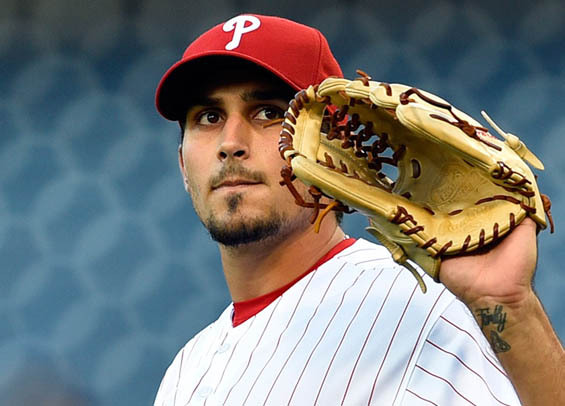 "I need to do a better job of pitching backwards, especially in fastball counts," Eflin said. "There's a lot of things I can work on, falling behind guys and not using my off speed when I needed to, that's what I need to tackle down there." The Reds tagged Eflin for three singles in the first, eventually scoring Jose Peraza on a Duvall single to center. Scott Schebler homered in the second advancing the Reds lead to 2-0, but the Phillies answered with four runs in the bottom of the frame, highlighted by an Andrew Knapp three-run homer that landed in the Phillies bullpen in center. The Reds erased the two run deficit in the top of the third on Duvall's first homer of the afternoon, a two-run shot to center. The Reds then went on to add insurance runs in the middle innings as the Phillies offense cooled to a halt. The Phillies had an opportunity to get something going in the sixth with Tommy Joseph and Michael Saunders each reaching to open the frame, but Maikel Franco grounded into a double-play and Knapp struck out to eliminate the scoring chance. The Phillies amassed 10 hits on the afternoon with Cesar Hernandez and Odubel Herrera the lone starters not to reach base. For Herrera, the 0-for-4 afternoon dropped his average to .217 on the season and .181 for the month of May. "We have a couple guys scuffling, including Herrera," Mackanin said. "I'll probably move him down in the lineup because I can't keep him in the two-hole, but he's got to fight his way out of it." With Howie Kendrick due back Monday it's possible Herrera soon gets a breather and Aaron Altherr slides over from left field to center field. If nothing else, at least now Mackanin has some options with four outfielders. "It's tough when you're going through a stretch like this," Mackanin said. "There's no real easy way out." Franco finds himself in a similar spot to Herrera, entering Sunday hitting .213 for the month. He did, however, collect a single in the fourth. "He's searching and you can tell he's down on himself," Mackanin said. "When he finds the way that he's been working on it and takes it into the game there's a good chance he'll break out of it." The Phillies open a three-game set in Miami on Monday. Sunday's loss cemented the Phillies ninth consecutive series loss, a figure that hasn't been reached since 1997 when the club lost 10 straight. Also, the bullpen scoreless streak came to an end in the ninth inning, toppling a mark that lasted for 22 1/3 innings, the longest in franchise history since 2004.